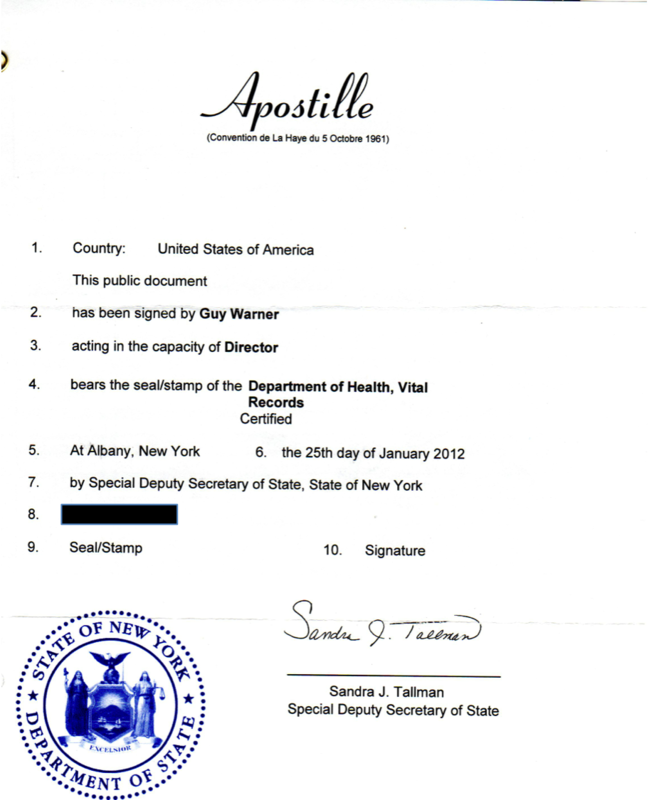 Today I received the an apostille for my great-grandfather's death certificate from NY State. Earlier I received naturalization records for my great-grandfather, Angelo Palmeri. Like many records from the years after my great-grandfather came to the U.S., it has his name misspelled "Palmieri" rather than "Palmeri". Angelo Palmieri was naturalized 5 July 1921. Because naturalization records cannot be amended by court order, I requested a search for the name "Angelo Palmeri". As expected, no record was found. Hopefully, this will be sufficient to show that the previously received naturalization record was indeed for my great-grandfather, despite the misspelling of the last name. 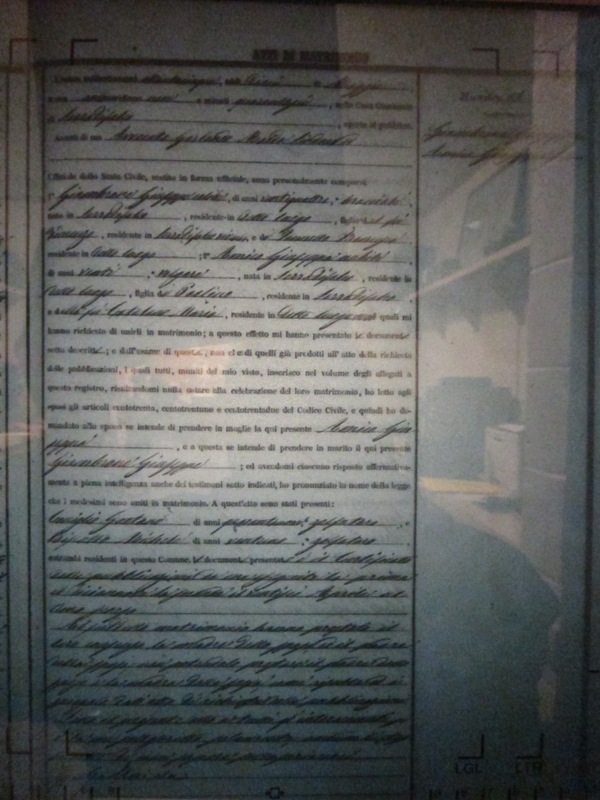 I found the marriage record for my great-great-grandparents, Giuseppe Giambrone and Giuseppa Amico, from Serradifalco, Sicily. They were married 10 May 1885. It gives my great-great-grandfather as 24 years old (born abt 1861) and my great-great-grandmother as 20 years old (born abt 1865). It identifies their parents, my great-great-great-grandparents, who were until now unknown, as Vincenzo Giambrone and Francesca Ianello for Giuseppe, and Paolino Amico and Maria Catalano for Giuseppa. 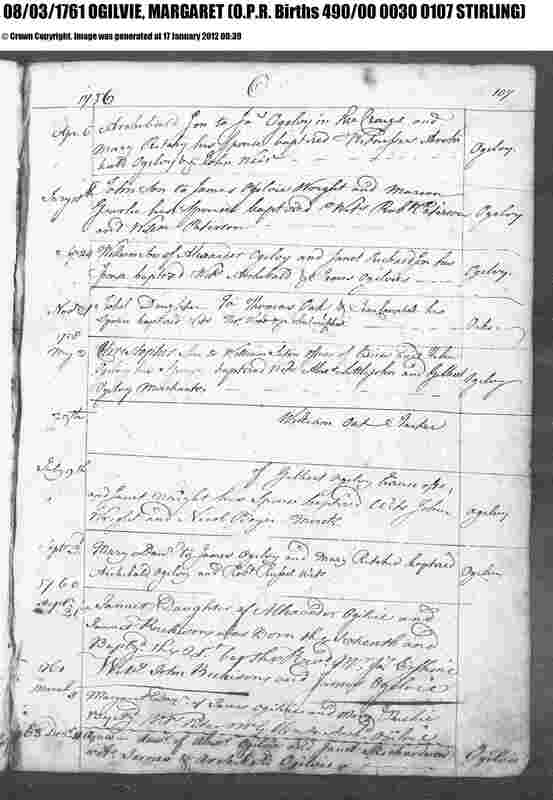 Margaret Ogilvie is my fifth great-grandmother from Scotland, married to David Downie in 1783 in Stirling Parish. 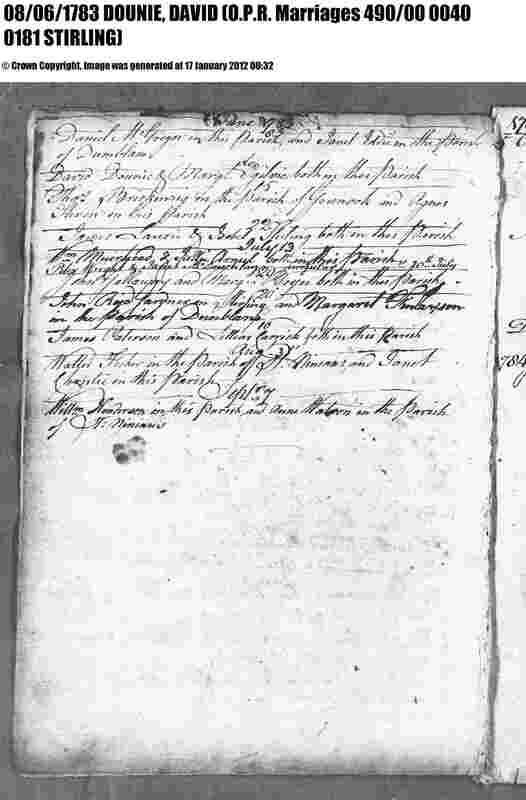 I did a search on ScotlandsPeople and found two birth records for a "Margaret Ogilvie" born between 1755 (which would make Margaret 28 when married, which is rather old for back then) and 1767 (which would make Margaret only 15 when married, which is rather young for back then). I found two records for Stirling, Scotland, one in 1762 to James Ogilvie and Mary Richie, and another in 1762 to George Ogilvie and Christian Leishman. After looking again, I discovered that the birth to James and Mary was the only one in Stirling Parish. 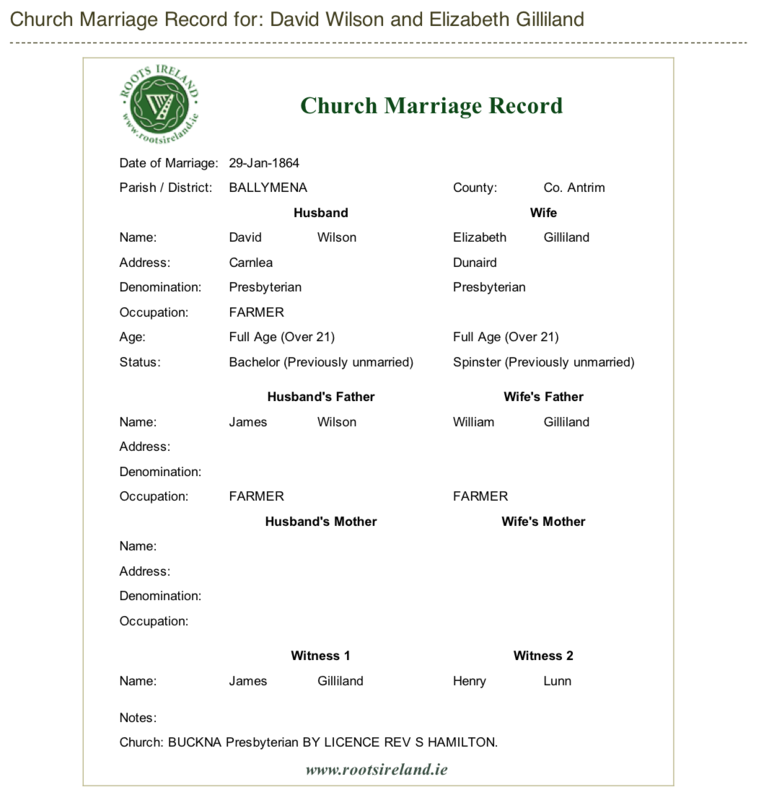 So while it's not definite, it seems more likely that her parents were James and Mary since the marriage record for Margaret to David Downie noted "in this Parish" which I take to mean "of this Parish". The birth record notes several other births for Ogilvie's, some of whom could be her siblings or her cousins. 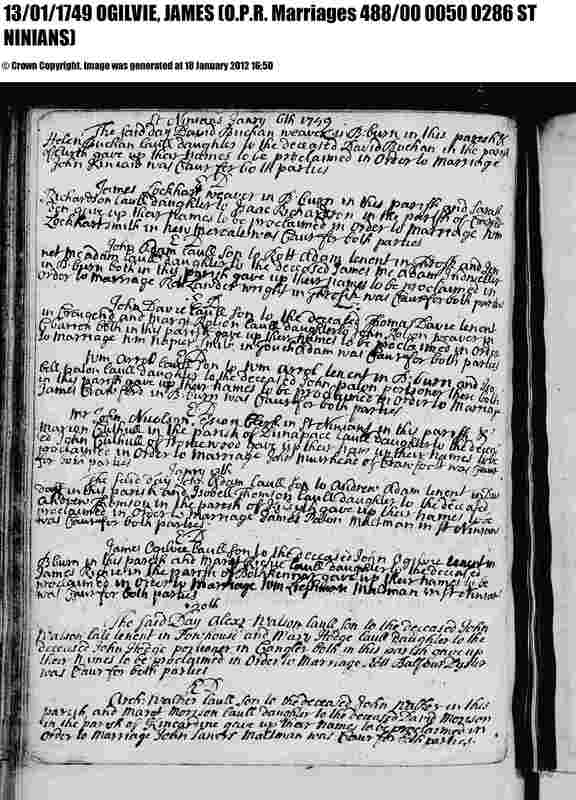 I then did a search for James Ogilvie and Margaret Richie and found a marriage record from 1749, which gives James' father as John and Margaret's father as James, both deceased at the time of the marriage. This seems more likely given that the wife's name is Margaret and the daughter's name in Margaret, which was a fairly common practice back then. John Ogilvie and James Richie would be my seventh great-grandfathers. Pretty cool given that when I started all I had was some of my (first) great-grandparents. My great-great-great-grandmother's brother, David Downie, was a missionary to India. On ancestry.com I found a link to a passport application he made to return to the United States. It's an interesting glimpse into his life. He was born in Glasgow, Scotland 29 July 1838. He emigrated to the U.S. in June 1852, residing in various places in the U.S. until 1873. He became a U.S. citizen in 1857. From 1873 on he was a missionary in India. 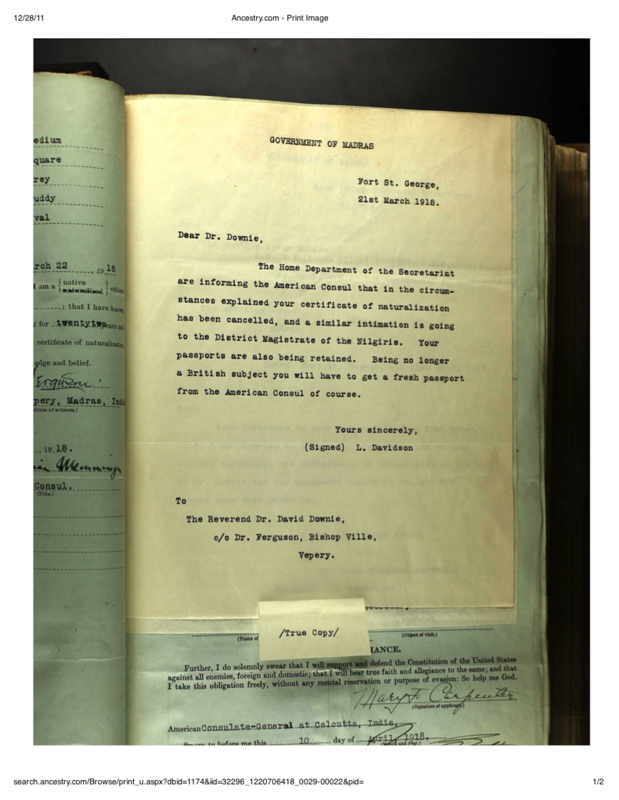 This is a 1918 request for an emergency passport so he can travel back to the U.S. It's interesting that it gives his destinations en route as the Straits Settlement in Ceylon, then Hong Kong, Japan, Canada, and then the U.S.
David Downie died nine years later 19 July 1927 in Pasadena, CA, at the age of 90. His wife was Annie Hershey. While I think she was perhaps from Pennsylvania, I could not determine whether she was related to the Hershey of Hershey's chocolate or not, but I also didn't spend much time looking. 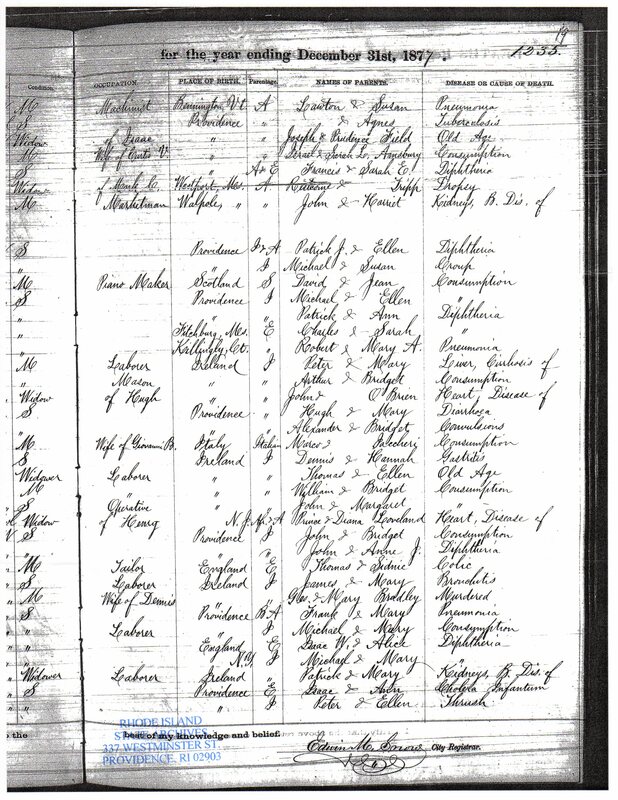 With a new search on Scotland's People, I found a simple marriage record for my great-great-great-great-great-grandparents, David Downie and Margaret Ogilvie. That were married in Stirling, Scotland 8 Jun 1783. In another attempt to clear up the spelling errors, where Angelo Palmeri was spelled Angelo Palmieri, I am writing a letter to the USCIS chief asking for a letter stating that the declaration of intent, petition for naturalization, and certificate of naturalization for Angelo Palmieri belong to one and the same person as the other vital records documents I have. Who knows if this is going to work. But it's worth a few stamps to see. 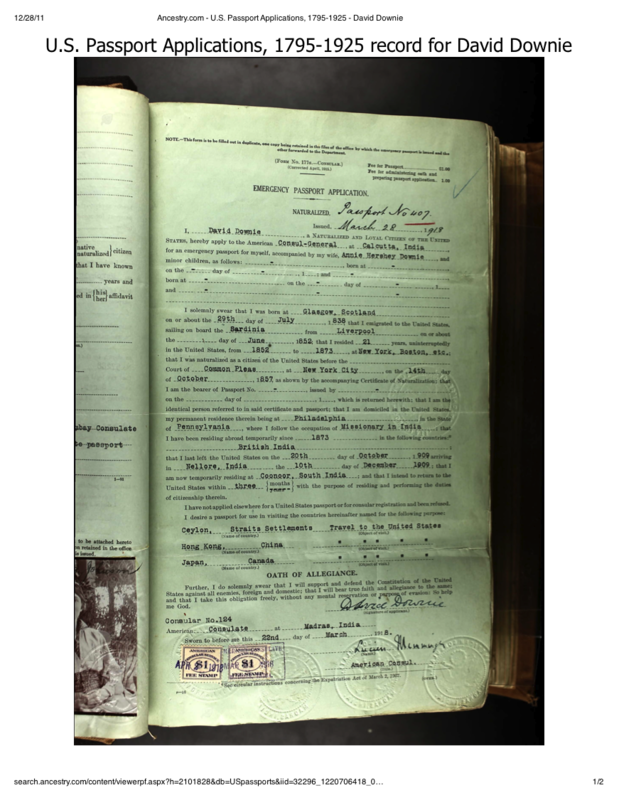 I recently requested and received naturalization documents for my great-grandfather, Angelo Palmeri (see Exhibit A). Unfortunately, because my great-grandfather was illiterate, several documents, including his naturalization papers, had his last name misspelled as Palmieri rather than Palmeri. Indeed, on his Declaration of Intent (Exhibit A), signed XXXXX, he signed by giving “his mark” and someone else signed his name on his behalf and presumably filled out the form for him as well. I understand that it is impossible to amend naturalization documents for people who are now deceased. Because I am using these naturalization documents for an Italian dual citizenship application, I respectfully request a letter from your office stating that the Angelo Palmieri on the naturalization documents is a.k.a Angelo Palmeri. I have included a description of the enclosed exhibits that I use to support this assertion, which includes his Italian birth and American death certificate. I understand that this is a nonstandard request. 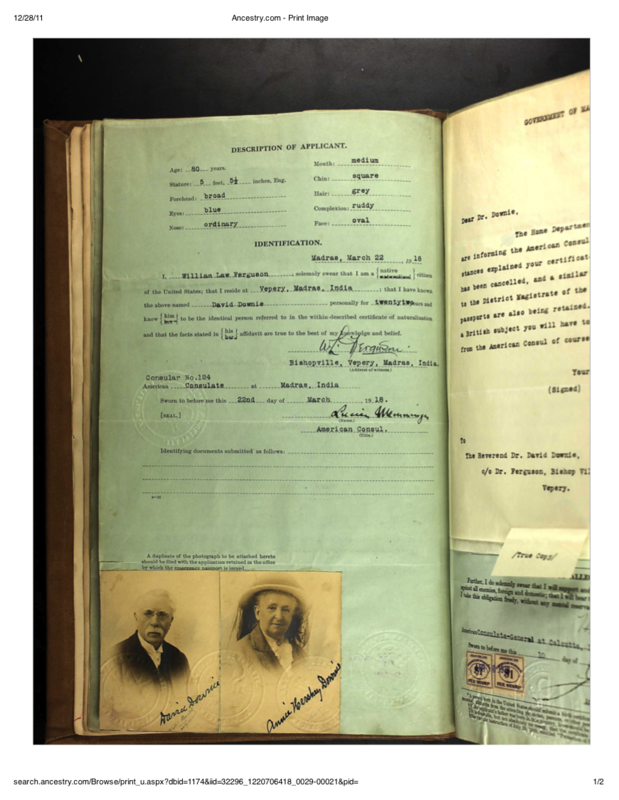 If helpful, I have included a proposed letter that may be sufficient to document that my great-grandfather, Angelo Palmeri, is one and the same person as the Angelo Palmieri on the naturalization documents. 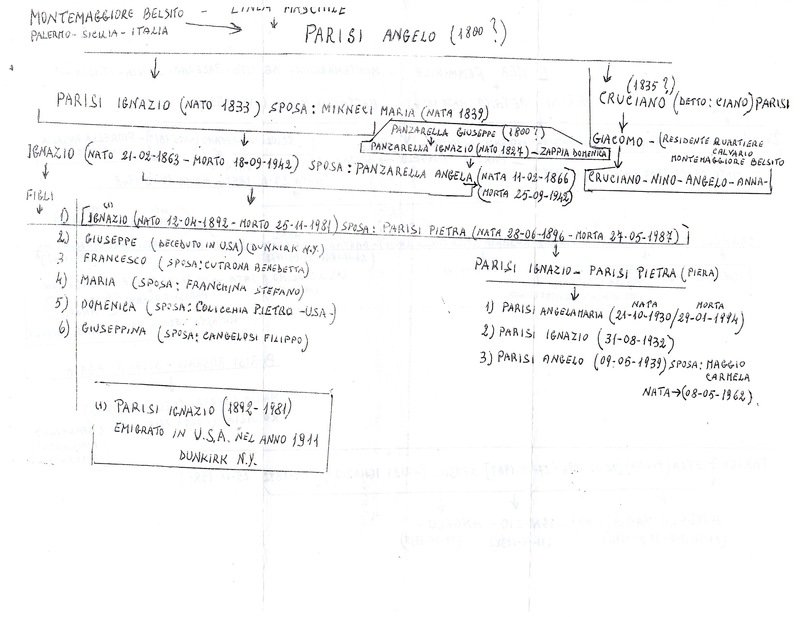 My great-grandfather, Angelo Palmeri, was born XXXXX in Serradifalco, Italy to Giuseppe (Joseph) Palmeri and Maria (Mary) Calabrese (see birth certificate for Angelo Palmeri, Exhibit B). As noted on his application for citizenship, he arrived in the New York XXXXX on the vessel XXXXX. 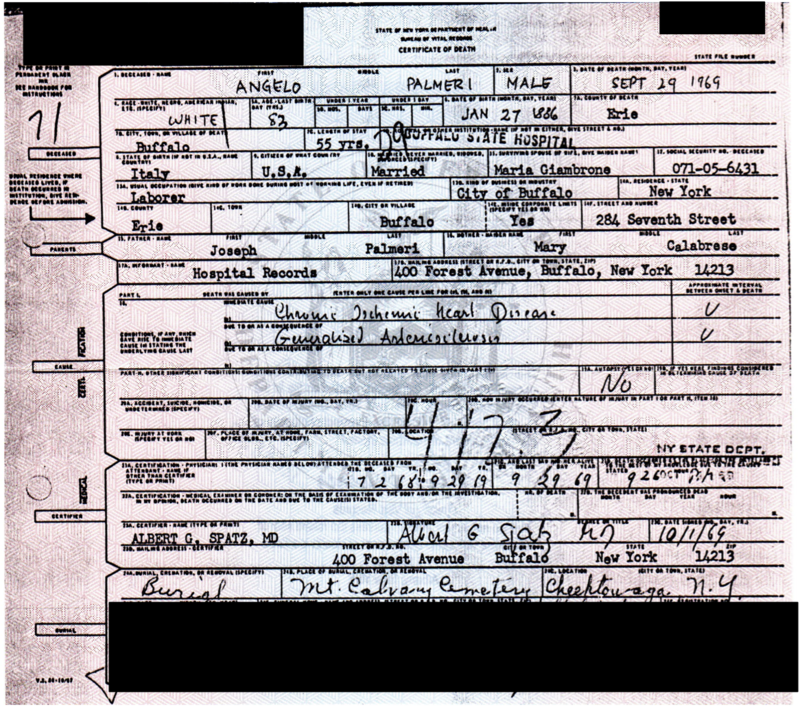 I have included a copy of the Passenger Arrival Record I received from the National Archives that shows his name spelled Angelo Palmeri, that he is XXXXX years old (born in XXXXX), his father is Giuseppe, and that he is going to Yatesboro, PA (Exhibit C). In Yatesboro, PA, on XXXXX, he married my great-grandmother. 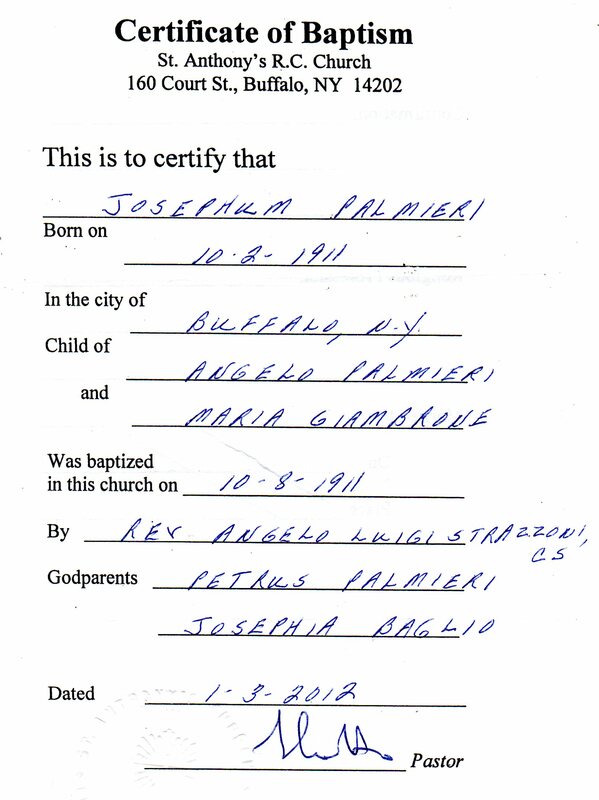 On the marriage license, (Exhibit D) his name is now misspelled Angelo Palmieri, giving his parents are Giuseppe and Maria Palmieri, with his age as XXXXX (born in XXXXX). On this form, he gave his mark, and someone else filled out the form and signed his name. 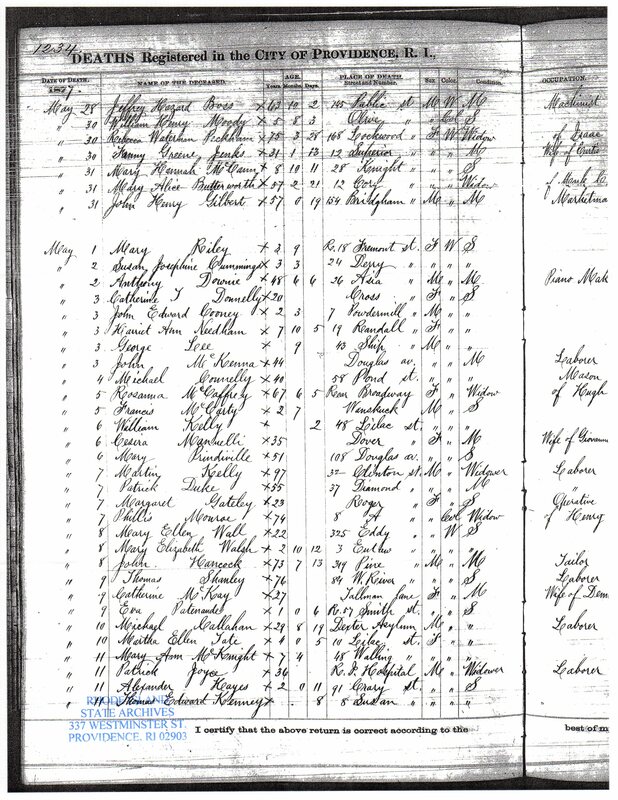 The 1920 Census in Buffalo, Erie, New York (Exhibit E) indicates that my great-grandfather was unable to read (column 17) or write (column 18). It gives his age as XXXXX (born in XXXXX), his wife Maria, his son, my grandfather, Joseph, and notes his citizenship status as “pa”. His brother (Calogero) and his family lived next door. His father-in-law (Giuseppe Giambrone) lived next door. Here, the name appears to be grossly misspelled as something like Palmire or Palmiri. Around this same time, he filled out his Declaration of Intent and Petition for Naturalization, where his named was misspelled Angelo Palmieri. The 1930 Census in Buffalo, Erie, New York (Exhibit F) shows his and his brother’s families living in the same home. Now all family members have the last name correctly spelled Palmeri. While my great-grandfather was still illiterate, my American-born 18 year old grandfather was able to read and write. Finally, the death certificate for my great-grandfather, dated XXXXX, correctly spells his name as Angelo Palmeri (Exhibit G), the spelling that appeared on his Italian birth certificate (Exhibit B). I thank you for your attention and your help in resolving this matter. Our letter XXXXX reported that we successfully retrieved a copy of the records of naturalization for Angelo Palmieri, born XXXXX in Serradifalco, Italy. We sent you The Declaration of Intent for Angelo Palmieri dated XXXXX, the Petition for Naturalization for Angelo Palmieri dated XXXXX, and the Certificate of Naturalization for Angelo Palmieri dated XXXXX. Angelo Palmieri, born XXXXX in Serradifalco, Italy was also known as (a.k.a.) Angelo Palmeri, born XXXXX in Serradifalco, Italy. 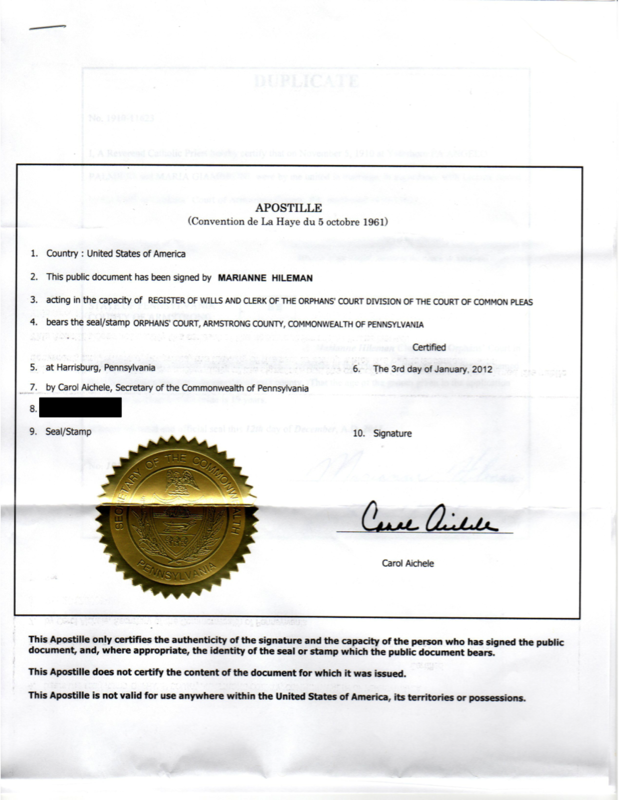 It is our determination that the Declaration of Intent dated XXXXX, Petition for Naturalization dated XXXXX, and Certificate of Naturalization dated XXXXX for Angelo Palmieri belong to one and the same person as the birth certificate for Angelo Palmeri from XXXXX in Serradifalco, Italy, the marriage certificate for Angelo Palmieri from XXXXX in Armstrong County, Pennsylvania, and the death certificate for Angelo Palmeri from XXXXX in Erie County, New York. I have received the naturalization documents for my great-grandfather. However, the last name is misspelled "Palmieri" rather than "Palmeri" on this and several other documents I have. Naturalization documents for deceased individuals cannot be amended. Today I am initiating a new search with the U.S. 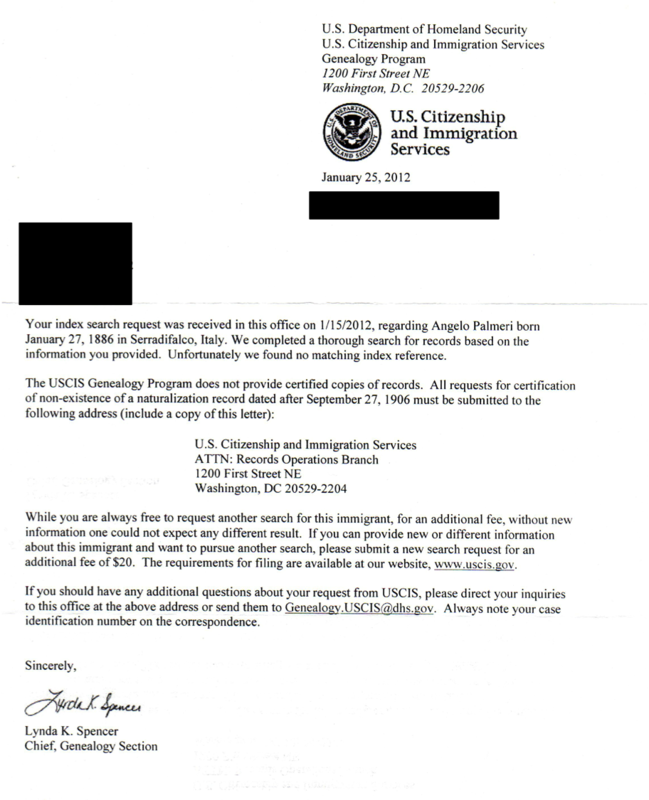 Citizenship and Immigration Service (http://www.uscis.gov/) for a letter of "no record found" for "Angelo Palmeri" with the correct spelling. I added explicit text stating that I have already received a record for "Angelo Palmieri" but I need a document that asserts that no one named "Angelo Palmeri" born 27 January 1886 in Serradifalco, Italy, has even been naturalized. I have finally received a certified copy of the death certificate for my great-grandfather, Angelo Palmeri. It took several attempts, but we finally got it. No surprises. No errors. His last name is spelled Angelo Palmeri, like his birth certificate. Sending this to get apostilled. 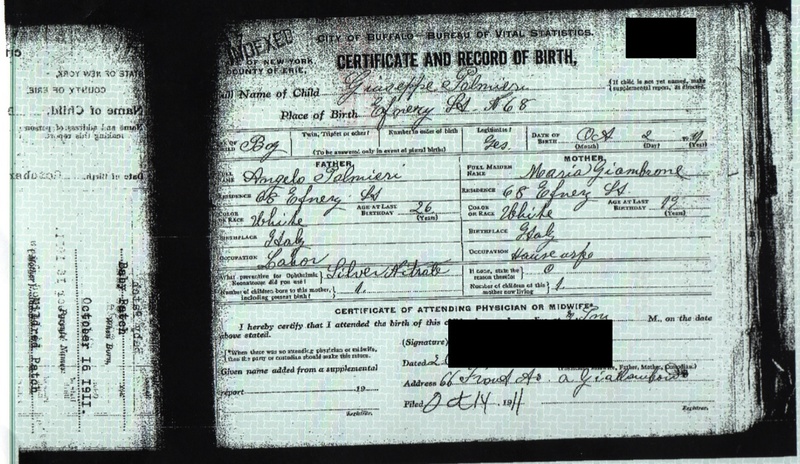 I have a genealogical copy of my grandfather's birth certificate. For some reason, I was able to get that a while back but I need a court order to obtain a certified copy (see below). He was born over 100 years ago. He died over 40 years ago. But I still need a court order. So I'm going to try to compile together the information I get on obtaining and putting together that court order. I'm just getting start started. "In order to obtain a court order you must prepare a Petition, which outlines you were are, what the relationship is to the person whose birth record you want, along with the purpose for the record. You may want to attach any documents you may have supporting your reasons for your request for a Supreme Court Order. Since you want to do this without the assistance of an attorney, you also must prepare a proposed Order for the Judge to sign if your application is approved. This office does not have any pre-printed forms for such a matter. Once you have prepared your petition & proposed order, they need to be submitted to the Chief Clerk's Office of Supreme Court in the county where your grandfather was born. If in Erie County, the address is 25 Delaware Avenue, Buffalo. NY 14202." I think from various things I found on the web, I can put together both a Petition and a proposed Order. What I am uncertain about is how to file a RJI (request for judicial intervention) and how to obtain an index number and whether I will need to do anything to issue a summons to the clerk of Buffalo, as suggested on various blog sites. 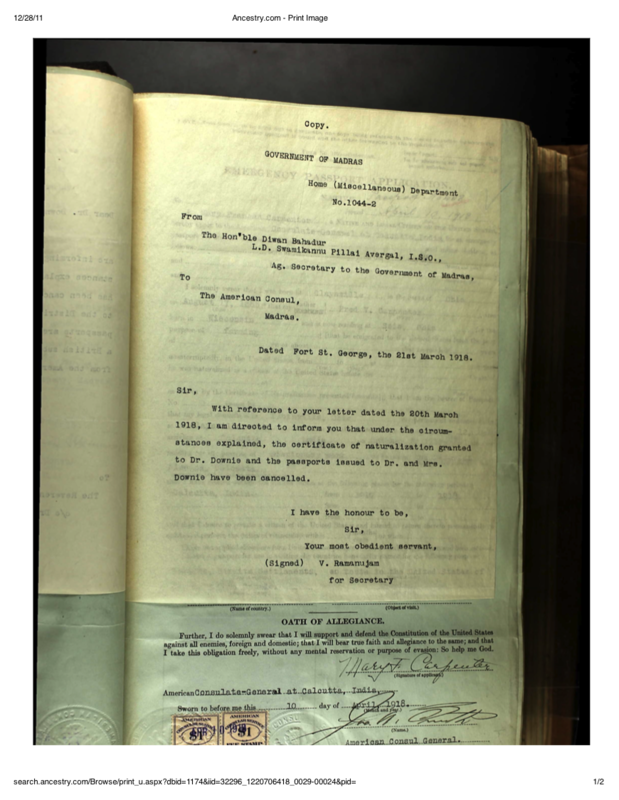 "As previously stated, the Petition, any supporting documentation and proposed order need to be submitted to the Chief Clerk's Office of Supreme Court in the county where your grandfather was born. If in Erie County, the address is 25 Delaware Avenue, Buffalo. NY 14202. Erie County does not require an index number nor an RJI unless you want the original documents to be on file with the Erie County Clerk. The petitioner can by-pass the County Clerk altogether and go straight to the Special Term Judge and take the order directly to Vital Records once the order has been signed. Regarding serving the Vital Records Office, I suggest you include a cover letter asking the judge if it is required to serve them." Based on this, and I followed up with more questions, it sounds like I can send a cover letter, a copy of the Petition, and a copy of the Proposed Order to the Special Term Judge, which now for Erie County appears to be Judge D'Amico. He may require that I "serve" the Vital Records Office or not. Who knows, maybe I would not even need to appear before him. Fingers crossed. "Your petition would go the Supreme Court Civil Special Term Judge not the County Special Term Judge. Your petition should be sent to the Chief Clerk's Office at 25 Delaware Avenue, Buffalo. NY 14202 because the application must first be logged in so that Supreme Court has a record of receiving the application and for tracking purposes. Paperwork should be sent directly to a judge only after the case has been assigned to that judge." "You should send your petition, proposed order and supporting exhibits to the Chief Clerk's Office. I would also suggest a cover letter, listing your complete mailing address, phone number and email address(optional) if the court needs to get in touch with you. I would also suggest including a self-addressed stamped envelope so that the order, petition, and exhibits can be returned to you once the order has been signed by the judge." My great-great-great-grandmother, Margaret Ogilvie Downie, married Thomas Cuthbert; she was my mother's father's father's mother's mother, if you can grock that. Her brother, Anthony Downie, was born 31 Oct 1828 in Gorbals, Glasgow, Lanark, Scotland. He died 2 May 1877 at the age of 48 in Providence, Rhode Island. 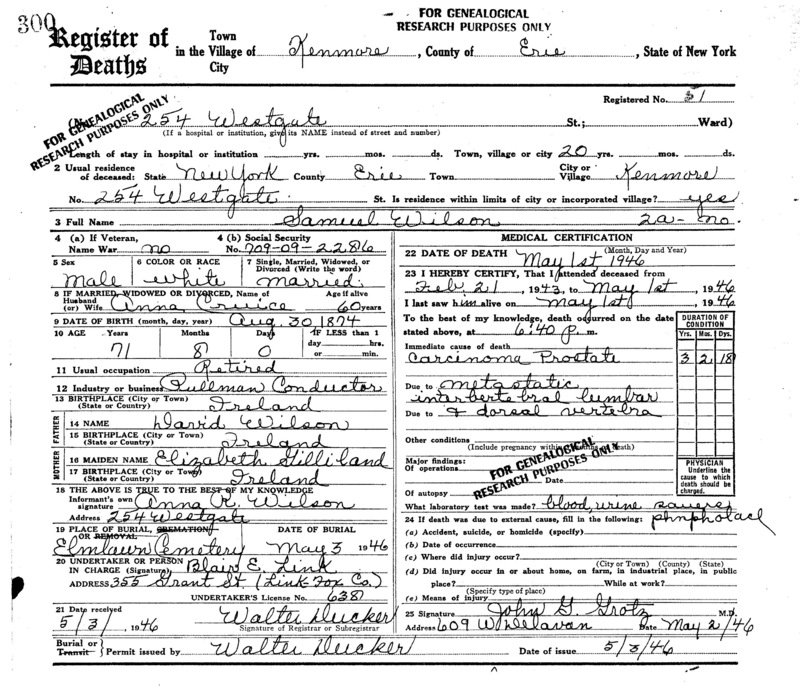 Here is his death certificate. I had hoped to confirm the name of his mother. I know his father was David Downie. And the death certificate lists his name as David, so that's confirmed. This also confirms that his mother was named Jean. But I need some confirmation on her last name. Various records give it as McMicken or McMeaghan. But this only lists her name as Jean. I've also mailed California to get the death certificate for another brother, David Downie. Maybe that will show more. Apostilles arrive today. Thankfully, they apostilled the only certified copy of my mother's birth certificate that we could find. That means no need for a court order to get a copy of it. Now I only need a court order for my grandfather's birth certificate. And then court orders to get the "Palmieri" misspellings amended. I had mailed St. Anthony's church in Buffalo to ask if they had a record of my great-grandparents' marriage (turns out they were married in Pennsylvania). While they (of course) didn't have that marriage, they did tell me that they had the baptism record for my grandfather. Joseph Palmieri (Josephum in Latin, "Palmieri" instead of "Palmeri" as he was erroneously named) was born 2 Oct 1911 and baptized 8 Oct 1911 in St. Anthony's R.C. Church in Buffalo. 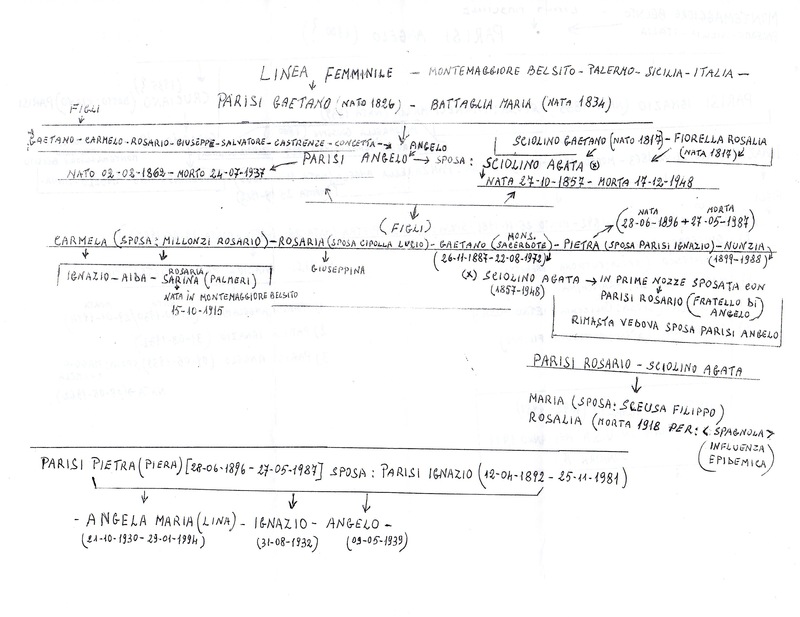 His godparents were his uncle, Pietro (Petrus) Palmeri (Palmieri), and Pietro's wife, Giuseppa (Josephine in English, Josephia in Latin) Baglio. My great-grandfather, Angelo Palmeri, immigrated to the US with Josephine Baglio, joining her husband, his brother, in Yatesboro Pennsylvania, were Angelo and Maria Palmeri were soon married after Maria immigrated a year later. The apostille for my great-grandparents marriage in Pennsylvania arrived today. I think I'm going to try to use this without getting name mistake corrected. If I go to the consulate and they demand a correction, I'll deal with that then. Maybe this isn't needed. But I am sending a letter to Serradifalco confirming that no one named Angelo "Palmieri" was born on the same day that my great-grandfather, Angelo Palmeri, was born. Several US records list his name as "Palmieri" rather than "Palmeri", so I am covering my bases here. Scusi. Non parlo bene l’italiano. Mi chiamo Thomas Palmeri, vivo in United State ma ho origini italiane e sto cercando di ottenere la cittadinanza italiana. Lei mi ha mandato il certificato di nascita mio bisnonno, Angelo Palmeri (nato il 27 gennaio 1886). Grazie mille. Purtroppo, alcuni record negli Stati Uniti hanno Palmieri invece di Palmeri. Il nome corretto è Palmeri. Ma i miei bisnonni erano incapaci di leggere o scrivere quando sono venuti negli Stati Uniti. Qualcuno ha scritto Palmieri per errore. Per la mia domanda di cittadinanza, ho bisogno di una lettera affermando che nessuno di nome Angelo Palmieri (al posto di Angelo Palmeri) è nato a Serradifalco il 27 gennaio 1886. I migliori saluti e grazie per la gentile assistenza.